Scan. Dismiss. Scan. Dismiss. Scan …click! This is what your audience is doing today. This is what we’re all doing today. In our inbox, on social media and on blogs, we scan through headlines, dismissing most and clicking a few. Winning that click depends on the headline, more than anything else. It’s impossible to overstate their importance. We are all judged instantly and ruthlessly by this short set of words. *Totally fabricated, but a great headline. Even if you do everything else right, blogging your fingers to the bone, everything will fail if you get this one thing wrong. So a great headline isn’t just one thing. A single article may have different headlines in different places. It’s adapted for each context. Do not try to make one size fit all. Now on to the checklist for writing great headlines. 1. Make a promise. Be specific. The key to the click is to understand this: Before any of us click anything, we do a split second cost-benefit calculation. Is the benefit of clicking (the value of the content) higher than the cost (two seconds of my time)? 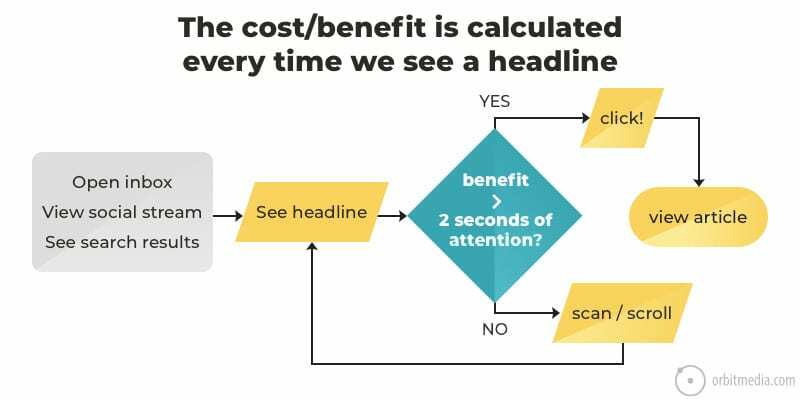 The job of the headline is to indicate the benefit and to make a promise to the visitor that it’s worth it. And to do it in less than a second. The more specific the benefit, the more likely the visitor is to click. Great headlines make specific promises. Ask yourself as if you’re the reader. “What’s in it for me?” The answer should jump off the page. If it doesn’t, get ready to hear crickets. You’re about to fail. The ability to imagine the readers’ perspective is the key to success in writing headlines. Empathy is the greatest marketing skill. 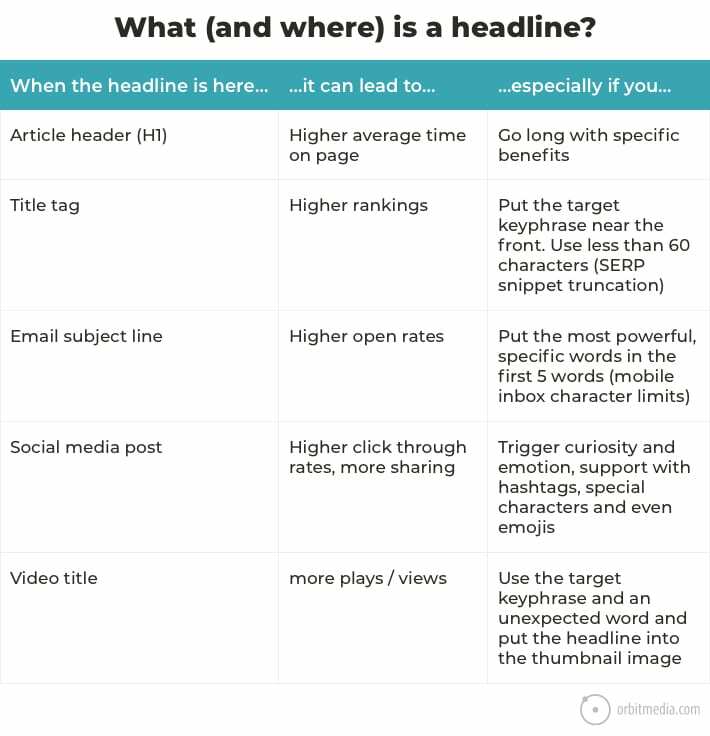 A few years back, Steve Rayson of Buzzsumo did a study to learn what makes effective headlines, and what correlates with social media engagement. His research was different in two ways. 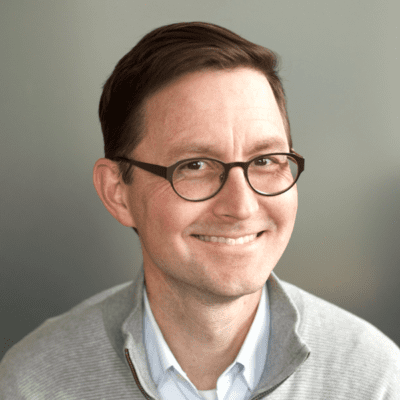 First, he looked at a LOT of data: 100,000,000 headlines. Second, he looked at trigrams, which are groups of three words. As it turns out, certain trigrams have huge correlations with social engagement. 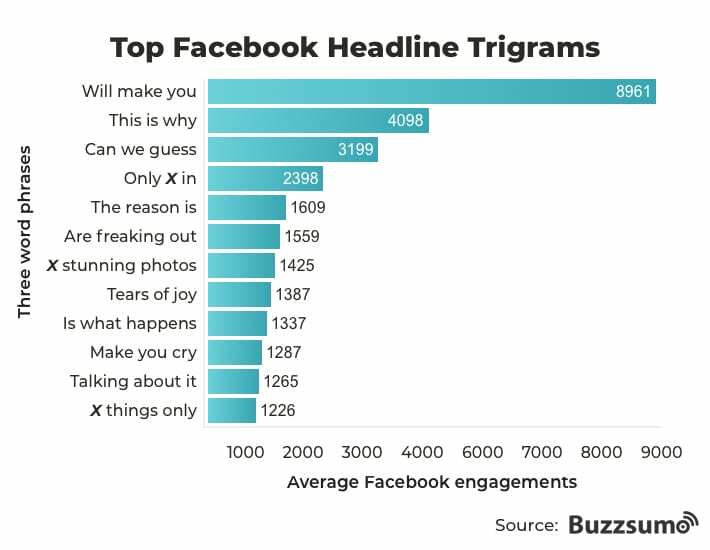 This chart shows the average number of Facebook likes, comments and shares for headlines that include these trigrams. If your first reaction is “this is clickbait” please keep reading. I am not recommending writing clickbait headlines. Do not try to trick the reader. Your article must deliver on the promise in the headline. But look closely at these trigrams and you can see why they work so well. They all make promises. 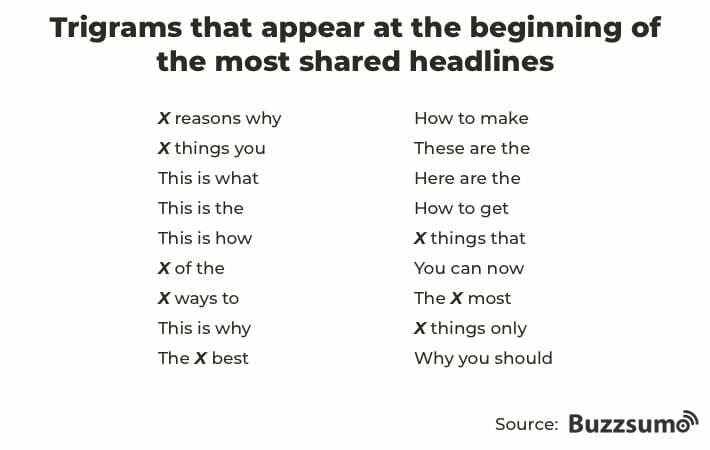 If you’re writing blog headlines that include these trigrams, you’re offering specific benefits to the reader. That one’s a joke. I simply combined a bunch of the top performing trigrams. It doesn’t even make sense. List posts are popular for a reason: they set expectations about the amount of content, about scan-ability and variety; if you don’t like one thing, you’ll be able to scan down and find something else. Headlines with numbers aren’t always list posts. Numbers can also be data and statistics, indicating that the article is supported by research. 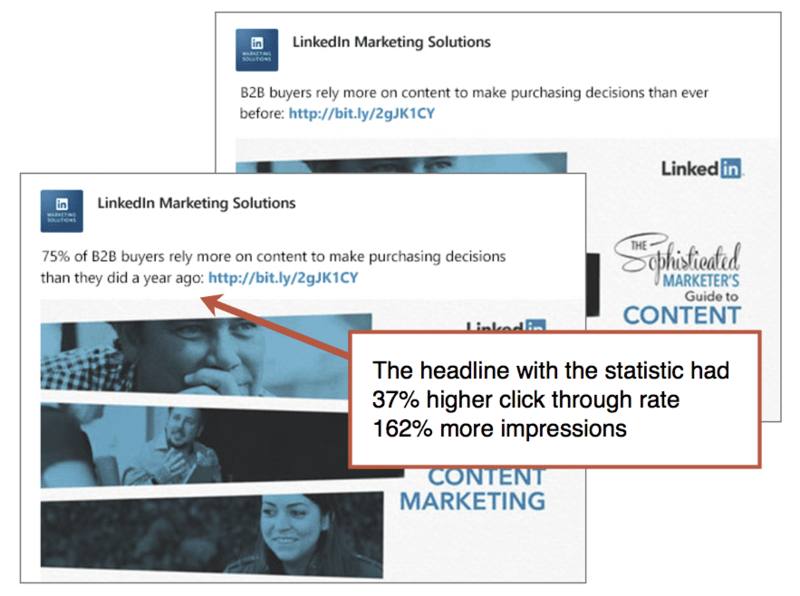 LinkedIn tested headlines with and without statistics and found that stats had a big impact on click through rates. “Don’t buy the argument that “those headline formulas don’t work any more” All that old “cheesy” advice can still be remarkably effective. Make sure there’s a benefit to the reader in the headline — something that person will get out of reading the content. Numbers in the headline still work. List posts still work. Question headlines have two benefits. First, they leverage a psychological effect, causing the reader’s mind to take the next step: answer the question …or wonder. The lack of completeness inherent in questions causes tension and interest in readers. Search is the second benefit. Google is focused on the meaning of a search query, not just combinations of words. It’s called “latent semantic indexing” and it’s key to Semantic SEO. The natural language of a complete question helps Google understand how the article is useful. People are using their voices, not just fingers, to search these days. And naturally, they’re asking complete, full-sentence questions. Complete questions and answers help Google connect people to your content. Why Do Dogs Bark at Night? 5 Dog Trainers Offer Tips for Quiet Canines. Which Superhero Are You? Take This Short Quiz and Find Out…. In the mobile inbox, subject lines get truncated after just 45 or so characters. In search results, title tags get truncated after around 60 characters. Podcast titles have the same issue. 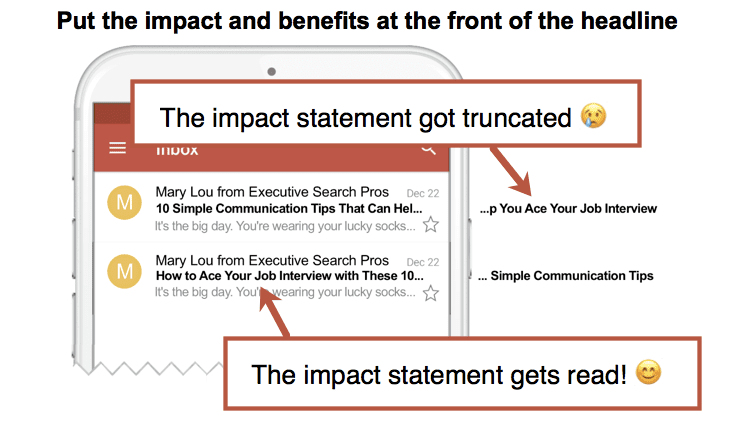 One subscriber sees the impact and benefit of clicking right there in the inbox: “ace your job interview.” The other would have to open the email to see that benefit statement. Here are a few more tips for increasing email open rates. Even when truncation isn’t an issue, readers will scan your headline from the beginning. So put those thumb-stopping words toward the front make them more likely to be seen, more likely to get tapped. So it’s front-loaded with impact words and benefits, but that doesn’t mean that the headline itself is short. According to that same research by Steve Rayson, long headlines are winning, at least in Facebook. 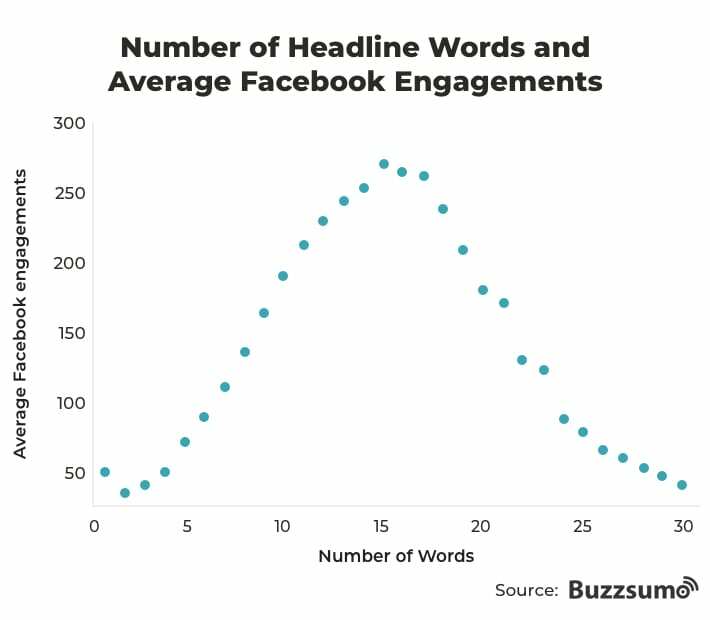 This chart shows the average number of Facebook engagements based on the number of words in headlines. That’s right. 15-word headlines had the highest average number of interactions. I suspect that most marketers have never written a headline that long. Try it and you’ll find yourself writing long, complete sentences. Or maybe two sentences. It makes sense since the longer the headline the more likely the reader is to find and understand the benefit to clicking. We recommend going long wherever truncation isn’t an issue. That’s social posts and <h1> tags (page headers). It won’t work for title tags or subject lines. Those will always be truncated by Google and inbox providers. Also good at the front of the headlines: target keyphrases. Using the target keyphrase at the beginning of the title tag <title> and header <h1> gives it “keyphrase prominence” helping to indicate its relevance to search engines. This is not important for subject lines and social posts. An effective headline works for both search engines and readers. To create headlines that rank and capture attention, use a colon. This lets you separate the search-friendly keyword from the social-friendly triggers. It gives you keyphrase prominence but still leverages human psychology in the rest of the headline. See the pattern? Each post is optimized to rank for the phrase at the beginning of the headline (with perfect keyphrase prominence) followed by a number or words to connect with visitors’ hearts and minds. Does it work? Search for any of those phrases before the colon in the headlines above. You probably see the post ranking for the phrase …and you might just click, thanks to the numbers and the benefit statements. Final tip: Write lots, choose one. The pros aren’t writing a headline. They are writing lots of headlines. For any article, you should write a dozen or more. Write several options for each location: title tags, headers and subject lines. Meet with your editor or get input from a friendly marketer. Once you’ve got a dozen or more, you can pick one and put the rest in the circular file (the trash). What do you think? Should we have gone with any of these? What a nice tips! Thanks! I am a student and beginner writer, so all these recommendations from a professional writer will be useful for me. After this article, I understand that I am not yet ready for large and difficult written work. I need good training and help from experienced writers. Therefore, I seek the help of writing services, which I find in the review of essayreviewexpert.com where smart and experienced writers help me get to their level and above.